While the new emojis of Unicode 10 have yet to launch, Unicode President Mark Davis this week revealed a collection of new emojis have been added as "draft candidates" for potential release in Unicode 11 in 2018 (via Emojipedia). The news came out of the quarterly Unicode Technical Committee meeting, and up next the Unicode Consortium will decide on the list of final candidates at its Q4 2017 meeting in October, followed by naming the new characters at a meeting in Q1 2018. 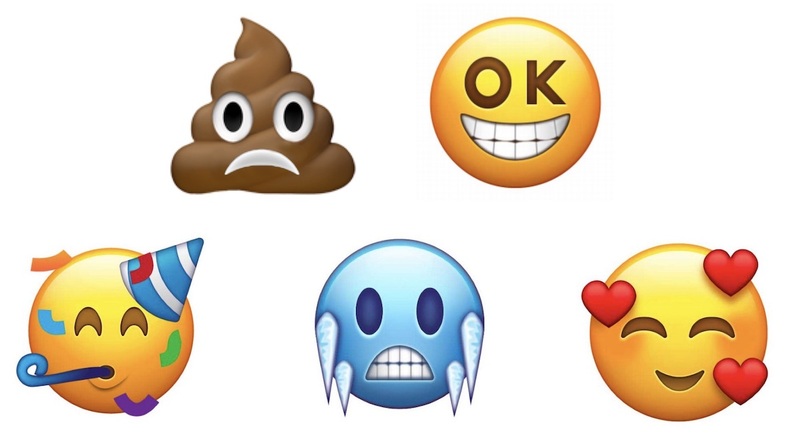 The 67 new characters proposed for inclusion in Unicode 11 include smiling face with three hearts, smiling face with party hat, blue face with icicles, grinning face with OK as eyes, and an inversion of the well-known poo emoji called "frowning pile of poo." There's also kangaroo, cupcake, llama, bagel, broom, skateboard, softball, smiling face with cape, and serious face with eye mask and cape. Since Unicode 11 is still so far from release, the list of its included characters and their designs are subject to change. Closer to release is Unicode 10, which Apple highlighted last month during World Emoji Day by looking at a few of the emojis coming to iOS, macOS, and watchOS later in 2017. New emojis include Woman with Headscarf, Bearded Person, Breastfeeding, Sandwich, Coconut, T-Rex, Zebra, Zombie, Elf, Star-Struck, Exploding Head, and more. Apple didn't specify a date for the launch of the Unicode 10 characters, but they should appear around the public debut of iOS 11 or soon after. It traditionally takes Apple a few months to include support for new emoji. Last year, the Unicode Consortium released Unicode 9 in June 2016, and then Apple debuted those characters in iOS 10.2 in October 2016. For a full list of the 67 new emoji candidates in Unicode 11, visit Emojipedia. Getting a bit out of hand. Too much to scroll through. Is it just me, or does this make you lose the will to live? Bring back the pistol, take back that squirt gun. I can actually feel all the MR readers getting triggered by anither emoji article. Seems we've come full circle back to hieroglyphics. Well, I was looking for an excuse never to visit this website again, and I think this is it. Laters, MR.
Great! thanks for addressing this well known issue.. while at it, any chance to deliver a proper dark mode? it has only been requested for over a decade now..
Not sure the Unicode consortium can help you with that.